Religion and faith has become a tool to manipulate the human mind. Those who resist against manipulative games succeed in the best way possible. But those who are not strong enough to fight against being brainwashed turn into a dangerous weapon that can kill innocent people. Nicolas Boukhrief’s Made in France is an intelligently narrated thriller which wisely captures the two sides of religion; the dark and the bright one. It just happened that, this time, it is that both sides have to go against each other for the good, hopefully, to prevail. Made in France follows Sam El Kansouri, who was born to an Algerian father and French mother. As a journalist, he infiltrates into a four-man Jihadist cell in the suburbs of Paris. After their leader and true inspiration returns from Mecca, he claims that he was ordered to create a terrorist cell across France for one day to attack it. Sam, having two options, whether to exit or stay, in the hope to stop the attack, finds himself in a continuous spiral of violence, where his hands as well will be covered in blood. When the film begins, it’s Sam’s voice that introduces us to himself and the cell he was right into. Christoph, Driss, SIdi are tightly close when they allow Sam to join them. Earning their trust and gaining enough materials for his article and sudden return of Hassan changes everything significantly for every man in the room. He, with the pride declares that he is assigned to begin the first wave of attack that will shake all of France, as the beginning of moving the Holy War into the Western World. When Sam secretly approaches authorities to warn them about the attack, he was asked to stay in the group until he gets more names. But all what Sam gets a minute after is one violent night after another, realizing that, if he isn’t careful enough, he can end up the same way as those who went against Hassan and his friends. But by looking at the three men, who proudly look at Hassan as someone for whom they can sacrifice their own life, Sam becomes a witness of how even a strong mind can be shattered if the right words can be used. Therefore, does it mean that he can reach out at least to four men’s mind to convince them to stop doing what they plan to? That’s something you will have to find out. 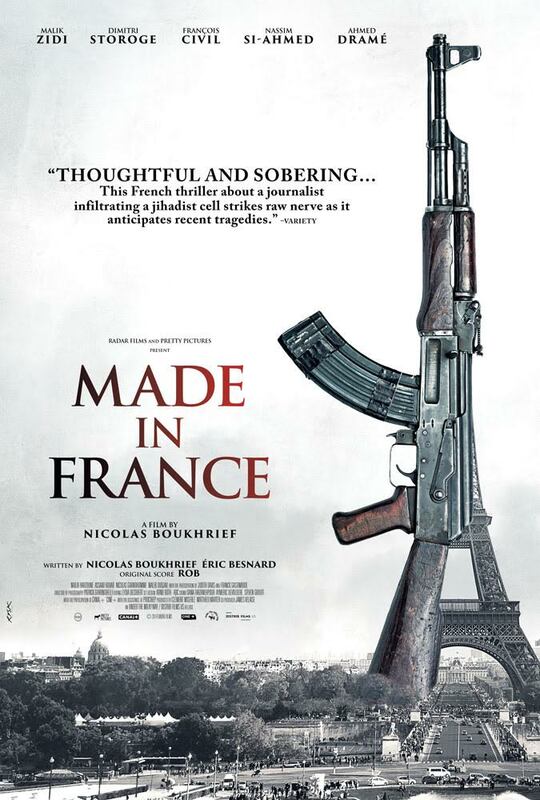 Made in France, unfortunately, is a relevant film to watch nowadays. However, what Boukhrief does is something, most likely Hollywood would have never done: he co-writes a protagonist character Sam, who is also a Muslim who believes that faith must never push anyone into darkness. That is the main reason Sam goes against his own “brothers” and friends to ensure that what he was taught by his Algerian father will at some point help him to transmit the real beauty faith can ever teach to people who think otherwise. In the end, there is no negativity in this film, but only nail-biting storyline with some impressive performances that will fulfill any Friday movie night.